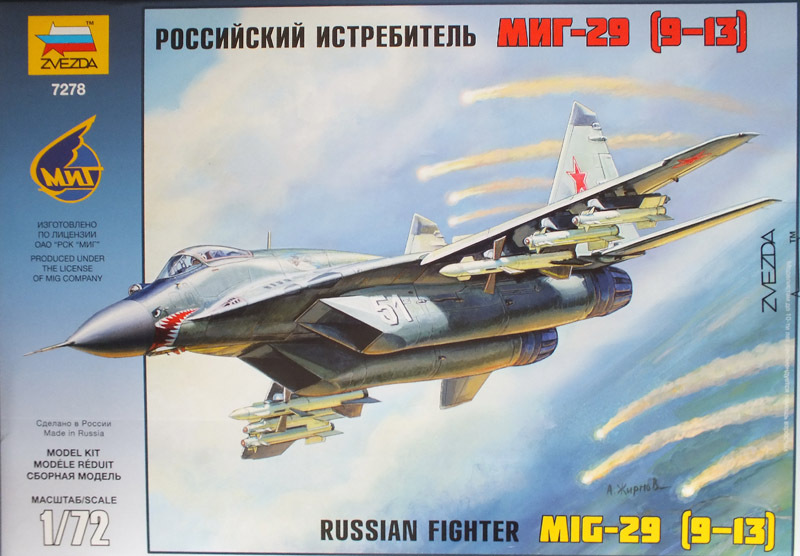 A MiG-29 (9-13) model arrived from Zvezda, and it is listed as new item for 2016. Model comes in an attractive box illustrated with jet from training center in Borisoglebsk. There are six trees with grey parts in the box, of standard Zvezda quality and one tree with clear parts of satisfactory quality. The quality of casting itself is good, panel lines are equalized and of corresponding scale. The disassembly of parts is performed well and there should be no problems in assembling this kit. Cockpit interior is rather poor in detail, but my assumption is that soon some aftermarket sets for this kit will appear. Two basic options for assembling this model are given – in flight or on the runway with appropriate pilot figure. Four variants of armament and undercarriage are given as well. As for the instruction sheet it is mainly satisfactory, with the drawback that some parts are lacking the paint instructions. Options are given for the three paint schemes. The already mentioned jet from the training center in Borisoglebsk from 2001 with interesting shark jaws under nose cone represents one of the options. Second option is from Erevan in Armenia from 2015, whilst the third is also with the shark jaws from 2008. Decals are nicely centered with a bunch of service labels. As conclusion, I would say that this is a must-have for all Russian/Soviet jet lovers.